Captain Glass: My problem is, I'm not totally crazy about the prospect of dying. Sgt. Dohun: So don't die. After successfully invading continental Europe on D-Day, the Allies sought to end the war with Germany by Christmas. British Field Marshal Montgomery planned Operation Market Garden, which would be the largest airborne assault ever attempted, with the intention of liberating Holland and seizing bridges on the German border. A Bridge Too Far, based on Cornelius Ryan's historical novel, tells the stories of the men who fought and died on both sides of the battlefield with a scope as large as the war itself. The movie is in the vein of The Longest Day and Tora! Tora! Tora!, with attention to historical accuracy overriding narrative concerns. Director Richard Attenborough and screenwriter William Goldman don't so much tell a single story as present various slices from the history book. The main character here is the war itself, which is represented by various actors portraying the real life heroes and villains of the battle. Under the direction of Gen. Browning (Dirk Bogarde), American, British, and Polish forces make their jumps roughly eight miles from the bridge sights. Maj. Gen. Roy Urquhart (Sean Connery) and Brig. Gen. James Gavin (Ryan O'Neal) lead their troops towards the bridges, but soon discover that their intelligence reports drastically underestimated the strength of the Germans. Lt. Gen. Wilhelm Bittrick (Maximilian Schell), Maj. Gen. Ludwig (Hardy Krüger), and Field Marshal Walther Model (Walter Khut) outfox the Allies at every turn, rendering the ill-supplied American and British troops pinned down and separated from the cavalry. A great deal of the script's first act is expositional, explaining the geography and tactical procedures under way. However, once the principal characters have been introduced and the fighting begins, the vicious nature of war dominates the screen. Some of the incidents are so absurd—such as a young man running across a field to retrieve hats and being shot—that they must be true. This is an anti-war film that respects the sacrifice of the various people who partake in battle. A Dutch family that feeds information to the Allies is given ample screen time, as is British Lt. Col. Frost (Anthony Hopkins). The integrity with which these people conduct themselves is awe-inspiring, and the filmmakers accurately capture it while refraining from glorifying war. Even more impressive is the respect it has for the German characters. The humanity of Gen. Bittrick, who grants Dr. Spaander (Laurence Olivier) a cease-fire to evacuate injured soldiers, demonstrates that even the enemy is not entirely bad. Attenborough stages the battle scenes effectively, conveying the chaos and fear of the characters. There's nothing especially innovative about his direction, but it utilizes time-tested techniques well. Perhaps there are a few too many shots of men chomping on cigars, but each actor fits into his role rather well. The large cast is populated by many familiar faces (which may take some viewers out of the story as they think "hey, it's Robert Redford"), but Hopkins and Schell are the true standouts, presenting men of honor who might actually be good friends if not for their conflicting loyalties. Set against the meticulous production design and grand shots of planes filling the skies, the vignettes chronicling Operation Market Garden brim with authenticity. I will not mention how the battle ends, even though it is probably well known, because for those unfamiliar with the true story it would spoil the conclusion's power. A Bridge Too Far mixes history with human drama, creating a thoughtful experience. The more I think about it, the better it seems to me. Image Transfer Review: The anamorphic 2.35:1 transfer has many print defects in it and a slightly soft look to it. The picture is grainy and the colors a bit muted, but detail is strong and the picture has a nice sense of depth. I've never seen the previous DVD release, so I cannot compare the two transfers. Audio Transfer Review: The Dolby Digital 5.1 mix sounds nice, but is extremely front heavy. Sound separation opens up the main speakers rather well and directionality brings the surround speakers into the action during a few key scenes. However, there are many missed opportunities to utilize the rear channels for ambience, such as when the soldiers retreat in the rain, and the overall experience leaves something to be desired. French Dolby Digital 5.1 and English Dolby Stereo 2.0 mixes are also available. Insert�contains notes about the production. Feature-Length Trivia Track�a subtitle track that gives information about Operation Market Garden. Richard Attenborough: A Director Remembers�an interview with director Attenborough about making the film. Photo Gallery�a collection of photographs from the movie. Extras Review: This new two-disc set contains new special features that did not exist on the prior DVD. A new insert has some stats about the production and the battle's history. It's quite brief, but the little snippets of information are worth looking at. The first disc consists of an audio commentary and feature-length trivia track. The audio commentary's participants range from director Richard Attenborough to writer William Goldman, as well as "key" crew members. None of them seem to be watching the film itself, but rather are giving interviews that have been edited into a commentary. Goldman dominates the track, though some of the best comments come from art director Stuart Craig and camera operator Peter MacDonald. They discuss working on the production and give some interesting anecdotes. More often than not, this is really just a collection of random thoughts, however. The trivia track gives some fascinating insight into the history of the campaign and links it into the larger history of 20th-century Europe. The only complaint about the track is the annoying bubbles the text is placed in, as opposed to just simply being placed inside of the black bars. Over on disc two, there are two documentaries. 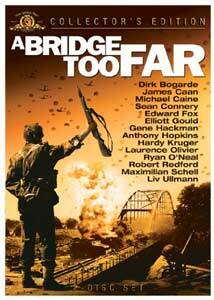 A Bridge Too Far: Heroes From the Sky (43m:32s) is a History Channel program, comparing the movie to the actual events. By and large, the film is extremely close to the true story, but there are a few interesting deviations discussed by the operation's survivors and Goldman. Narrated by Burt Reynolds, the documentary gives a nice overview of the movie's production and reception. A Distant Matter: Memories of Operation Market Garden (16m:59s) features interviews with the men who survived the assault, giving them the opportunity to tell their own stories. This is an eloquent feature and it has some interesting insight into the plan's controversy. Following that is the video interview Richard Attenborough: A Director Remembers (18m:05s). Attenborough is lively as he recalls how he got the job and the process of making the film. He also elaborates on his opinions about war, though the bulk of his comments pertain to his intentions with the film. There's also a Photo Gallery with pictures from the set, though most of them are just publicity stills. Rounding out the extras is the movie's theatrical trailer, as well as trailers for The Bridge on the River Kwai, "The Best of WWII Movies," and The Great Escape. A Bridge Too Far: Collector's Edition does not have a perfect presentation, but it is a fair representation of the film on DVD. Coupled with nice special features, this is well worth a double-dip.